Just the thought elicits visions of maniacal laughter, devilish plots, bumbling sidekicks, and plans to take over / dominate / destroy the Earth. We root for their failure, cringe at their dastardly deeds, and weep at the havoc they wreak. But to a superhero, these evildoers are as important as ying is to yang. Without them, there would be no dark to offset the light side of the force, no one from whom to rescue Lois Lane, and no one to threaten Gotham City. If the Jedi had been successful at stopping the Emperor, the Empire would have never come to fruition, and OB1 and Anakin would have found themselves unemployable. Potential Employer: So, Anakin Skywalker, it says here in your resume that you used to hunt down Sith Lords. Anakin: Yes. I don’t tolerate planet-destroying, maniacs, hellbent on enslaving the galaxy. Potential Employer: I see. (Long pause) The problem is, we serve burgers and fries, and don’t really worry too much about what people do outside of the restaurant. Sometimes we say something if they take too many ketchup packets, but if they want to take the entire human race captive, there’s nothing in the store manual that says we should stop them. Without villains, heroes are just regular people with–in a regular day-to-day sense–unuseful skills and abilities, and an exuberant palate for extracurricular activities. But what makes a really great bad guy? Let’s do a quick run-down on some of the things that we look for in our favorite anti-heroes. Clothing. First, they must look the part. There are some folks that really persevere in the “looks evil” department, but I think Loki gets my trophy for Best Dressed. Flowing capes, embossed armor, ginormous horns, the Loki stick, crazy enraged army alien dudes. What he lacks in charm, he more than makes up for in dramatic accouterment flair. Let’s face it, this guy always looks more put together than Taylor Swift. He’d double the circulation of Vogue if this theatrical prom-queen pranced across its cover. Voice. No matter how sinister a villain looks, if he sounds like a Powerpuff Girl, he won’t command respect. No one does it better than Darth Vader. He has the deep dark brooding voice, the sinister breathing, and every time he enters a room, the Imperial March plays from some speaker someplace. Menacing Expressions. If one is to be a villain, one MUST have many thoughtful and sinister expressions. Whether you’re a fan of the original Khan played by Ricardo Montalbán or the new Khan Noonien Singh played by Benedict Cumberbatch, you’ve got to admit, facing this guy on your big screen TV in outer space will loosen your bowels. Willing to be a Team Player. Many hands make the workload light. Like the Hokie Pokie, that’s what it’s all about when you’re trying to get something major done. Ya know, like wiping out the human race. The Borg, Storm Troopers, Congress–all scourges of the galaxy. But not even the self-important pomposity of the IRS compares to the evil race created by a computer virus with delusions of grandeur. Cyberdyne Systems Model 101 Series 800 Terminator created by Skynet needs no introduction. You thought fire ants at your picnic were a problem, you ain’t seen nothing ’til a group of these guys come traipsing over the hills and through your potato salad. What if a Bad Guy isn’t Entirely Bad? Ahhhh, now this is interesting. Lately, my wife, Erin Rhew also a writer, and I have been watching Falling Skies. In this amazing series, the Earth is taken over by extraterrestrials and, on the cusp of extinction, mankind is forced to band together. There is, of course, a lot of drama that arises when fighting with an interstellar species after most of the human race has been obliterated. And you’d think that facing overwhelming odds would be enough to make people not complain about whether the toilet paper roll should be over or under. But, alas, even in a dystopia where the humans are on being exterminated, people still can find ways to be as mature as roving bands of middle schoolers. John Pope won’t stand for under-hung toilet paper. He likes it over the top. He’s an ex-con and abysmally self-centered. He commands a small posse of Berserkers and doesn’t take orders from anyone. He kills, he steals, he’s belligerent, challenging, throws tantrums, and is a menace to society. He fights against the army that’s trying to stop the aliens, killing some of the soldiers, taking supplies, and disrupting attempts to organize…usually. Yet, when he’s been relied on and could really stick it to the commander and his people, he comes through. He’s rescued kids when he could have walked away. Shown up in the nick of time to save someone he purports to be an enemy. Fights back-to-back with men, who, only moments before, he’d been about to throw down on. He slides back and forth across the line between downright awful to team hero. This guy has charisma oozing out of every orifice. He’s intelligent, cunning, and complicated. He’s a bank-robbing, murdering, drug-dealing, white supremacist that has spent a bit of time in jail and most of his life evading the law. US Deputy Marshal, Raylan Givens, is both his best childhood friend and his nemesis. Raylan bends the law to do what needs to be done…actually, he twists it into a pretzel. He’s killed more murderers, thugs, and mobsters than any other lawman on the eastern seaboard. Both men ride the line between bad and good, Raylan just barely on one side, Boyd just barely on the other. What transpires as these two face off, is a game of hopscotch where they step over the line…again and again. Raylan’s trying to do the right thing, often by doing the wrong thing. Boyd, who purportedly doesn’t care about anything or anyone, will show up at the most random time to save Raylan who’s gotten himself into a fix. We also see Boyd evolve, falling in love, and even dreaming of a simple life out of crime. Not that he could ever pull it off, but he occasionally dreams of it nevertheless. What I love about this show, is the razor thin line between good and evil. No one is entirely good and no one is entirely bad. These guys are separated by a hair and a few life experiences. Boyd seems just as baffled by his desire to do good, as the people who witness the phenomenon. His inner-good samaritan torments him more than any man with a badge ever could. This is what makes bad guys great. Now, go out there hug a bad guy and thank them. They give your hero a good name. He and his brilliant, stunning author bride, Erin Rhew, live a simple life with their writing assistant, a fat tabby named Trinity. They enjoy lingering in the mornings, and often late into the night, caught up Erin’s fantastic fantasy worlds of noble princes and knights and entwined in Deek’s dark underworld of the FBI and drug lords. 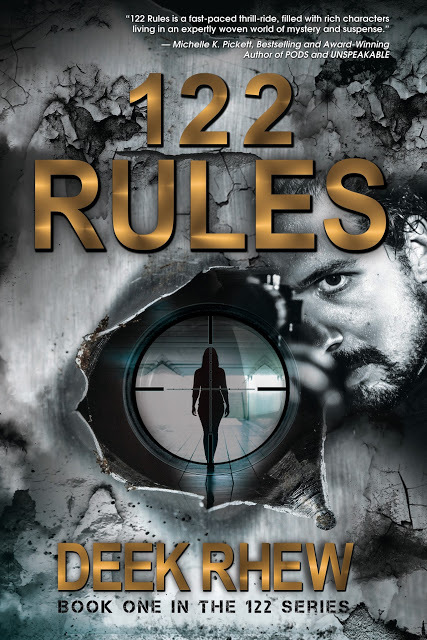 Read #122Rules to join the fray. Excellent post! I love a good villain, myself, though I think that the kind who are utterly evil (such as a few of your early examples) can be just as much fun as the ones who walk both sides of the line. Wonderful that the world of fiction can give us both kinds, and everything in between! I am like you Lily. Villains get the blood pumping and the imagination firing. I am with you Lily! This post was wonderful and allowed a new perspective on a good villain. Sweet! I’m so glad you liked it and share my affinity for the villains. Fiction does give us the opportunity to stretch our creative legs, trying to imagine the motives and thoughts of someone who’s just evil. Thanks for stopping by and leaving your thoughts, Lily! Woop! Thanks for sharing, Vicki!